ESTECO, a company from Italy that we’re working closely with in a number of different countries, and Lanner are collaborating to extend the options for our customers in data analytics. ESTECO is a software provider highly specialised in numerical optimisation and simulation data management. Their product modeFRONTIER is widely used in optimising engineering designs and the team working in Detroit in North America has successfully adapted it to work directly with WITNESS when running and analysing WITNESS simulation model results. WITNESS Experimenter includes a number of algorithms that search intelligently for optimum solutions and we’re proud to also offer a full API to run WITNESS Experiments. This allows companies such as ESTECO to seamlessly access WITNESS models and apply their own analytical approaches. Key to digital success in the new smart era is the ability to crunch numbers and make sense of data quickly. With modeFRONTIER, ESTECO shows that many different and complex objectives can be handled automatically and simultaneously. In this case study, ESTECO present an example analysis of a test model that has 138 Million options. They explain the methodology used to run WITNESS, the algorithms employed and the highly informative charts and tables that result. Let us know what you think and please contact us if you’re interested in exploring further. The key to enhancing the value of your simulation is in the ability to enable predictive and prescriptive analytics on top of your simulation model. Further it is crucial that the manual efforts in executing these analytics are reduced for simulation engineers by enabling a degree of automation. This would reduce and streamline the complexity in applying analytics and decision-making methods with your simulation. 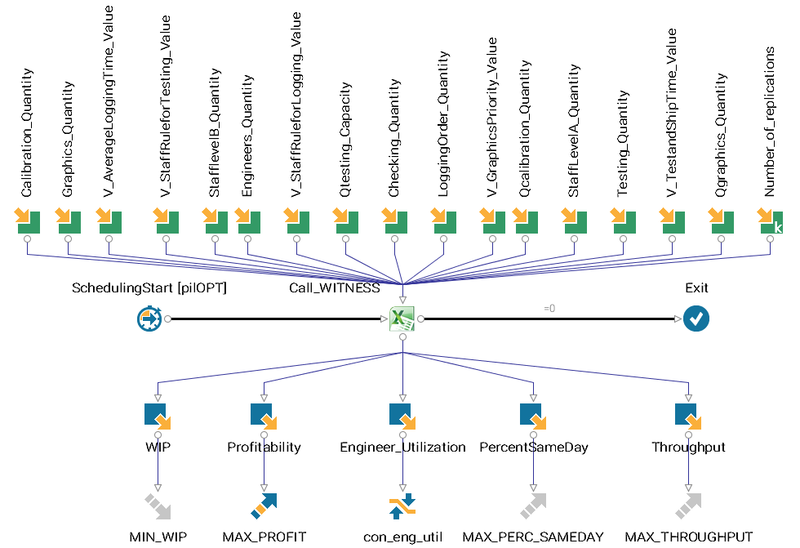 In this case study, we explore this aspect of realising value of your simulation by integrating a WITNESS Computer Assembly Simulation Model in modeFRONTIER, a comprehensive solution for process automation and multidisciplinary optimisation in the engineering design process. With six stations and three different staffing levels., the computer assembly simulation model simulates the computer assembly from order logging to shipping. There are sixteen independent variables that can be varied to optimise this model. The performance measures such as Total Throughput, Staff Utilisation, Work-In-Progress, Profitability, and Same-day Shipment are tracked for this model. The goal of this study is to optimise the assembly line to maximise Profitability, Total Throughput, and Same-day Shipment, while minimising Work In-Progress, subject to a maximum allowed limit on Staff Utilisation. The table above highlights the sixteen parameters and possible number of levels each parameter can be set at. Mathematically you can have 138,240,000 scenarios that can be set for the above parameter set. Considering the computational expense, it would be quite time-consuming to run all of these scenarios to identify best solutions. On the other hand, prescriptive analytics, relying on optimisation algorithms and data analytics, can help us examine the decision space, and identify the optimal solutions effectively and efficiently. To allow the optimisation algorithm to drive the simulation model, first we need to automate the running of the WITNESS simulation model through modeFRONTIER. The integration of the WITNESS simulation model in modeFRONTIER is achieved through VBA scripting in Microsoft Excel. This methodology of integration allows modeFRONTIER to run different simulation scenarios without launching the WITNESS model in GUI, which requires human intervention. Once this process automation is complete, the user can easily run a variety of iterative studies on the simulation model, such as Design of Experiments (DOE) and Optimisation. The primary goal of carrying out a Design of Experiments (DOE) on a simulation model is to perform statistical data analysis to gain insights into the problem. Through modeFRONTIER we run a Uniform Latin Hypercube (ULH) DOE of 1000 scenarios for the computer assembly model. We can then carry out detailed statistical analyses using the data generated through these simulations to obtain further insights. 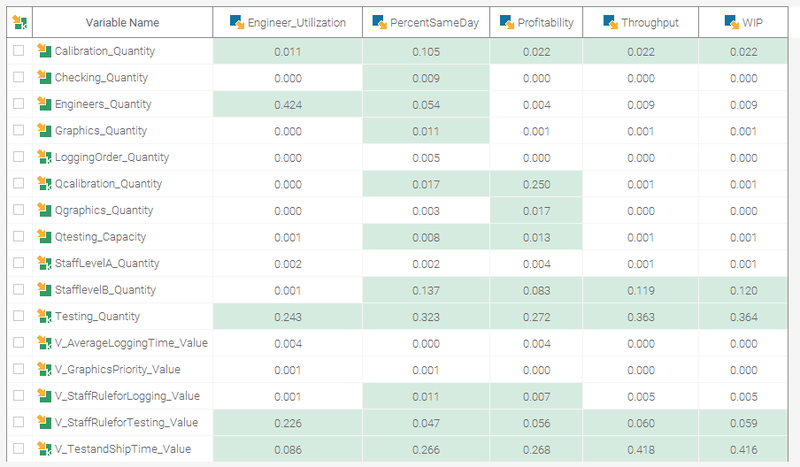 First, we examine modeFRONTIER’s Scatter Matrix chart for all the performance measures we are tracking in this simulation. This type of statistical analysis helps us identify linear correlations between the different performance measures and analyse how each of them is spread over the design space. The scatter matrix chart below indicates that the Throughput and the Profitability are strongly and positively correlated (with a Pearson Correlation Coefficient 0.855, indicated in the fourth row of the matrix), meaning that when the throughput increases, the profitability would strongly follow and increase as well. Another important statistical tool useful to simulation users is a sensitivity analysis. Sensitivity analyses help identify key independent variables impacting performance metrics, and the quantitative nature of their impact. If an independent variable is not strongly impacting any of the performance measures, it can be set to a nominal constant value, thereby increasing the efficiency of the search. modeFRONTIER comes with several in-built statistical sensitivity analysis methods. For this problem, we applied the Smoothing Spline ANalysis Of VAriance (SS-ANOVA) technique. This algorithm is based on a function decomposition method and it captures the main and interaction effects both linearly and nonlinearly. The figure below shows the sensitivities plotted for Profitability. It can be seen that the factors Testing Quantities, Testing and Ship Times, and Calibration Quantities are identified as the top three key variables. Moreover, the top nine variables account for at least 99% of the total effect on Profitability. To help the user identify variables which could be removed due to their weak effects (in this case less than 1% is defined as “weak”) across all performance measures, SS-ANOVA colors the box white indicating the weak effects, while a green box indicates a variable with relative effect above 1% for that metric. In this case, we can recognise that Testing Quantity, Test and Ship Time, Staff Level Category B are the most important variables that have influence across performance measures. On the other hand, variables such as Order Logging Quantity, Staff Level Category A Quantity, Average Order Logging Time and Graphics Priority have minimal impact across all performance measures. Now let’s talk about Optimisation. As the foundation of prescriptive analytics, Optimisation helps to identify optimal scenarios which achieve best performance measures. As we can see from the aforementioned Scatter Matrix chart, since Work-in-Progress (WIP) is very linearly correlated with Throughput, it is not necessary to include it as an extra objective in the optimisation, which allows us to reduce the burden on the optimiser. We utilise a flavor of Genetic Algorithm from modeFRONTIER called Non-dominated Sorting Genetic Algorithm - II (NSGA-II). Starting with a ULH DOE of 30 scenarios as the initial population and a maximum of 100 generations, NSGA-II converges in 2754 simulation runs out of the total allowable 3000 (30*100). The optimisation results are then analysed to understand the trade-off between the different objectives. In the above figure you can see a four-dimensional bubble chart indicating Pareto solutions with two dimensions represented by x (Profitability) and y (Throughput) axis, while the bubble size (Same Day Shipment) and bubble colour (Engineer Utilisation) represent two more dimensions. It can be seen that the normalised trade-off on the Profitability is much larger than that on the Throughput. There are no variations of the same day shipment percentage for all of the Pareto solutions because all of them achieve 100% same day shipment. This suggests we could focus only on the objective Profitability and turn the multi-objective problem into a single objective problem. We utilise a flavour of Genetic Algorithm from modeFRONTIER called MOGA-II with the same starting population and total number of maximum allowed runs as before, i.e., 3000. The optimisation converges after just 729 simulation runs. Analysing the optimisation data using a history chart, we see that there are two equally good optimal solutions with the same Profitability value of 5.747 (design 387 and design 636). However, by looking at the associated input combination, the “Graphics_Quantity” and “V_GraphicsPriority_Value” for these 2 optimal solutions are different. This allows the decision maker to pick alternatives without losing optimality, rather than relying on one single optimal solution! Below is a scatter chart that compares the single objective solution with the previous multi-objective Pareto: the single-objective solution was able to push the Profitability further from 5.457 to 5.474. With a simple example in this technical case study we highlight the importance of process automation of simulations and the added value of DOE, data analysis, and optimisation techniques in modeFRONTIER. The DOE, followed by the statistical analysis, helps identify the decision space and the key variables affecting the performance measures. The optimisation drives simulations in WITNESS and efficiently finds optimal solutions once the optimisation statement is defined, whether it is formed as single objective or multi-objective optimisation. All these techniques help simulation engineers understand and quantify the different decision levels at hand. modeFRONTIER and WITNESS together not only help engineers identify the optimal solutions, but also assist the decision-making process by presenting a set of optimal alternatives. Zhendan Xue is working as a Senior Research and Application Engineer for ESTECO from their Novi, Michigan office. He has been with the company for over 8 years supporting ESTECO customers in their engineering optimisation activities. He graduated in 2009 with a PhD, specialised in Design Optimisation in Mechanical Engineering, from the State University of New York at Buffalo. His technical interests are Design Optimisation, Design for Six Sigma, Machine Learning, and Data Analytics.